There is an MDX Function Module (BAPI) available in BW systems for retrieving data. Its name is BAPI_MDPROVIDER_GET_MEMBERS and it is sometimes referred as “GetMembers” BAPI. Sometimes it is worth to use this BAPI as it is used by frontend tools like WebI. While investigating inconsistencies in data provided by the WebI vs e.g. tcode RSRT the BAPI might be good starting point. 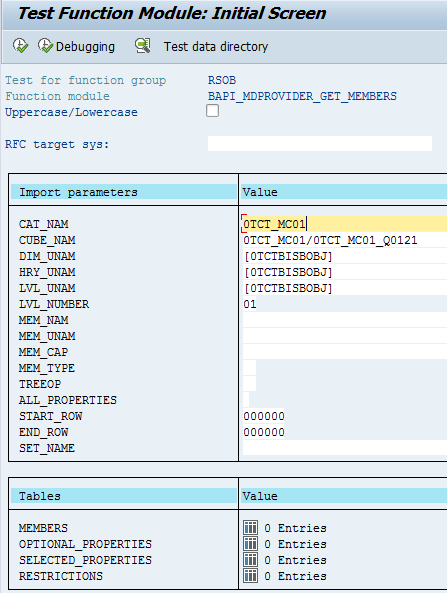 In below example I use technical content InfoProvider - 0TCT_MC01 Front-End and OLAP Statistics (Aggregated). Below is example call of the BAPI. The data is returned in table parameter called MEMBERS. Frontend (BEx) tools of SAP BW are supporting recording of traces. Such traces can be useful for providing detail information for SAP support team in case creating incident via SAP Support Site. How to enable generation of BEx tools trace files?